Boring! The Haynesville Shale rig count was unchanged this week at 23. Louisiana held at 14 and Texas did the same at nine. The Baker Hughes U.S. rig count was up two this week to 1,748. 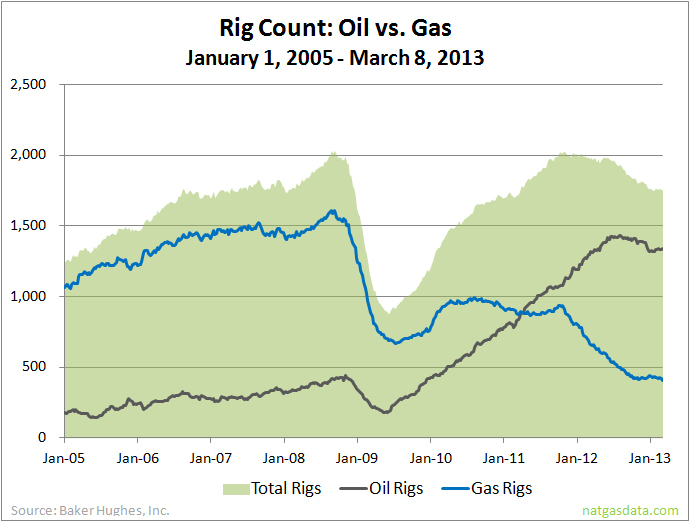 Oil rigs were up 30 to 1,354, gas rigs were down 29 to 389 and miscellaneous rigs were up one to five. This is the smallest number of gas rigs operating in the U.S. since May 21, 1999. 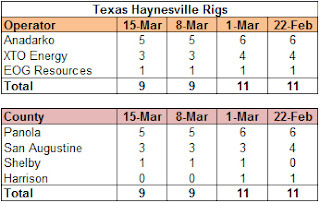 By type, horizontal rigs were down one to 1,099, vertical rigs were up 11 to 443 and directional rigs were down eight to 206. Among gas rigs, horizontal rigs were down 25 to 277, directional rigs were up two to 64 and vertical rigs were down six to 48. 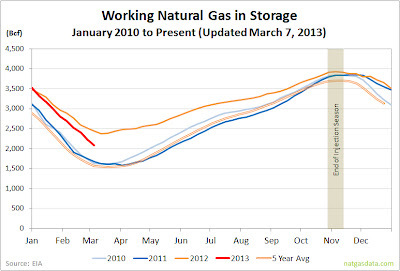 The EIA reported that working gas in storage dropped by 95 Bcf to 1.781 Tcf. The weekly withdrawal was way, way, way better than historical averages, given that both last year and the historical averages for this week are net injections into storage. The current weekly withdrawal was net 140 Bcf greater than last year's 45 Bcf injection and 101 Bcf higher than the five year average's 6 Bcf injection. The current storage level is now 26.5% below last year (2.423 Tcf) and only 3.5% above the five year average (1.72 Tcf). What a difference a few cold fronts will make! The current storage level is now only 61 Bcf higher than the five year average. Will that gap be narrowed or wiped out in next week's report after this week's chilly weather across the country? 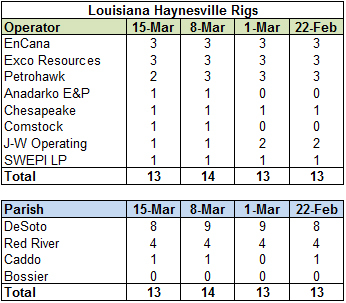 The Haynesville Shale rig count was up by one rig last week to 23. Louisiana was up one to 14, while Texas held at nine. The Baker Hughes rig count was down 30 this week to 1,746. Oil rigs were down 17 to 1,324, gas rigs were down 13 to 418 and miscellaneous rigs were unchanged at four. 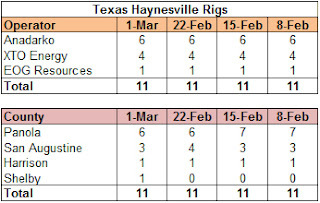 By type, horizontal rigs were down 31 to 1,100 (lowest level since August 2011), vertical rigs were down four to 432 and directional rigs were up five to 214. Among gas rigs, horizontal rigs were down 16 to 302, directional rigs were up five to 62 and vertical rigs were down two to 54. 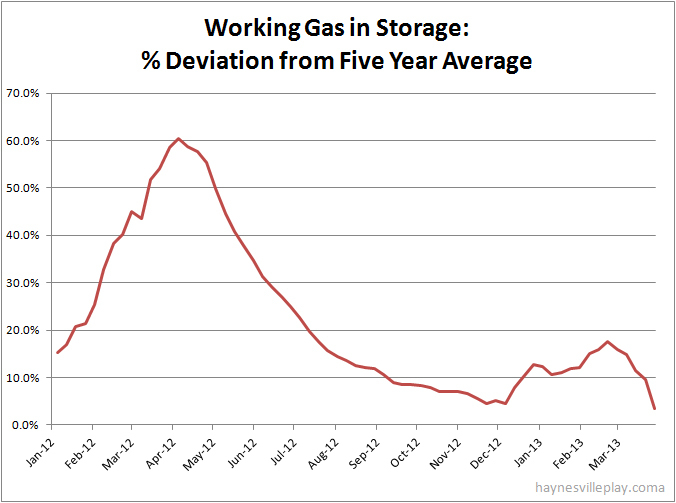 The EIA reported that working gas in storage dropped 62 Bcf last week to 1.876 Tcf. The weekly withdrawal was 62 Bcf higher than last year, which was unchanged at 2,378, and 36 Bcf greater than the five year average of -26 Bcf. The current storage level is now 21.1% below last year (2.378 Tcf) but 9.5% above the five year average (1.714 Tcf). Temperatures last week averaged 43.9 degrees, 6.1 degrees cooler than last year and 0.6 degrees warmer than average. A small group of landowners including notable investor (and "Bass Brother") Ed Bass have sued Chesapeake Energy for underpayment of royalties from the Barnett Shale in Tarrant Co., Texas. The suit is a contract dispute that alleges that Chesapeake passed on costs not actually incurred and charged other expenses that the contract with the landowners excluded. Chesapeake's royalty payment practices have drawn much criticism over the years, so this suit certainly won't be the last one of its kind. As with many other aspects of its business, Chesapeake employs aggressive business practices, so its legal department stays quite busy. As previously noted, natural gas consumption in 2012 was 5.1% greater than in 2011 and 10.9% above the ten year average. 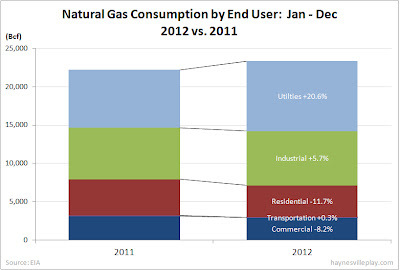 The biggest reason for the greater consumption was higher use in the utility sector, which used 20.6% more gas in 2012 than in 2011 and 43.4% more gas in 2012 than the ten year average.. Residential consumption was the biggest loser in 2012, down 11.7% versus 2011 and down 12.9% compared to the ten year average. 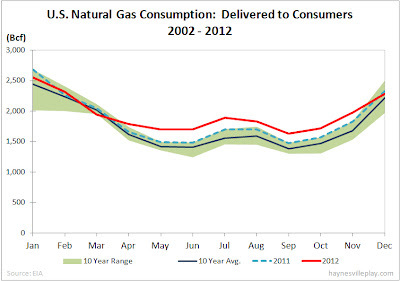 The EIA reported that December 2012 natural gas consumption, measured as gas delivered to consumers, was 2.285 Tcf, which was 1.6% lower than December 2011 (2.323 Tcf)/ But total consumption in 2012 was 23.351 Tcf, which was 1.132 Tcf, or 5.1%, higher than 2011. 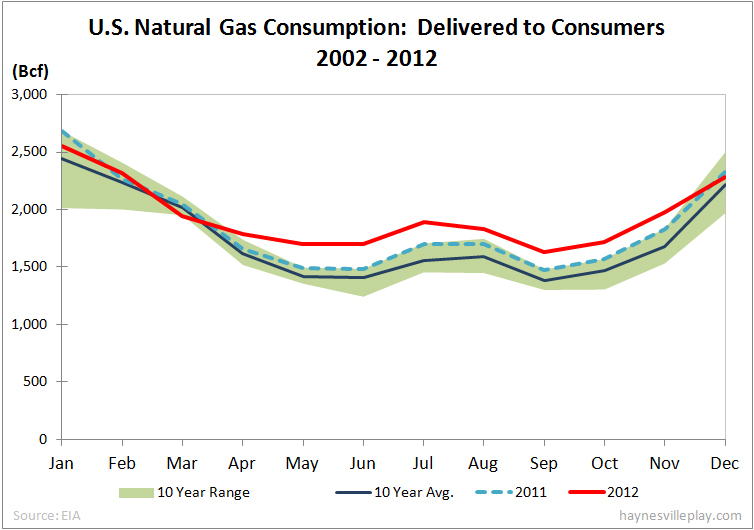 Compared to the trailing ten year average, 2012 consumption was 2.299 Tcf, or 10.9%, above average. 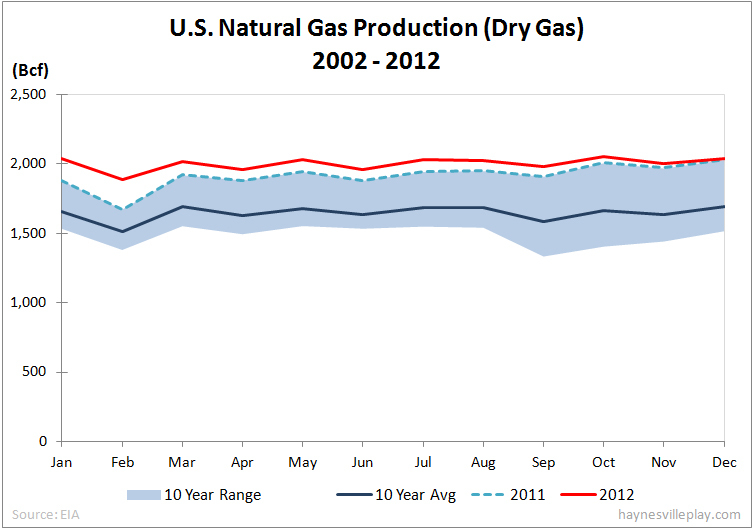 The EIA reported (a few weeks ago...) that December 2012 U.S. total dry gas production was 2.041 Tcf, which was 0.5% higher than December 2011 and 20.4% higher than the ten year average. 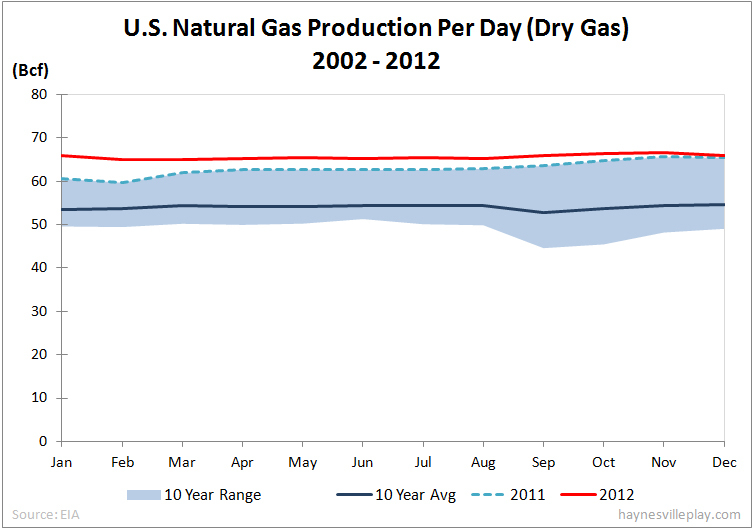 Production per day in December averaged 65.8 Bcf/day, which was 21.3% higher than the ten year average of 54.7 Bcf/day. One of the my favorite things about living in the U.S., especially now, is the environment of constant innovation. A new start-up in San Francisco called Siluria Technologies is bringing a new natural gas to liquids technology to market that doesn't depend on the Fischer-Tropsch process. Unlike the Fischer-Tropsch method, which requires high heat and lots of energy, Siluria's process supposedly requires lower heat and less energy. The technology is not proven at scale, but it has attracted significant venture capital backers. 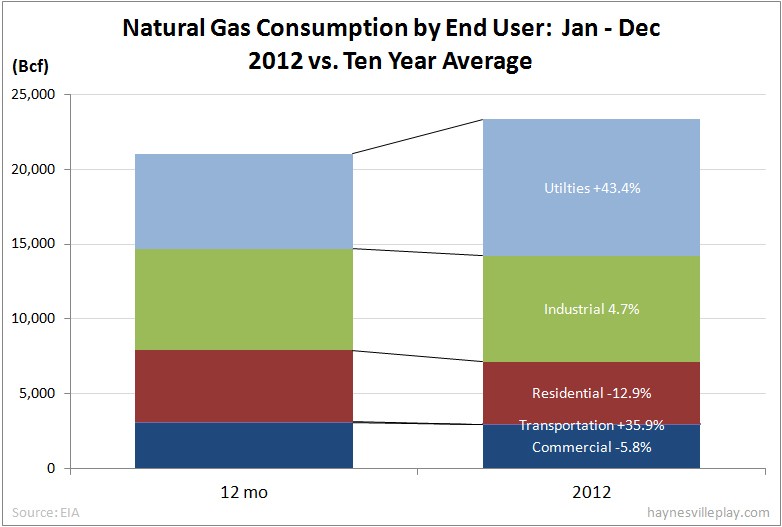 Depending on the viability of the technology and its ability to both scale and survive higher natural gas prices, we might have yet another potential end user market for natural gas. Put it on the list. 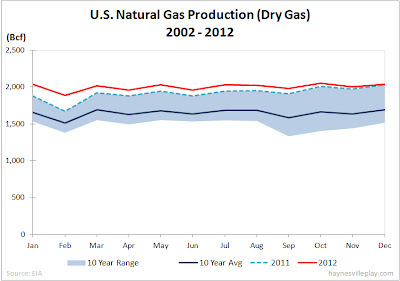 It won't help natural gas right now, but it is one of many things that make the future for gas look rosy. All you fat brains out there, just keep 'em coming! The Haynesville Shale rig count was down one this week to 22. Louisiana was down one to 13, while Texas held at nine. The Baker Hughes U.S. rig count was up 24 this week to 1,776. The gain was entirely in gas rigs, which jumped to 431, the biggest weekly increase since January 2010. By type, horizontal rigs were up one to 1,131, vertical rigs were up nine to 436 and directional rigs were up 14 to 209. Among only gas rigs, horizontal rigs increased by 16 to 318 (74% of all operating gas rigs), directional rigs were up three to 57 and vertical rigs were up five to 56. 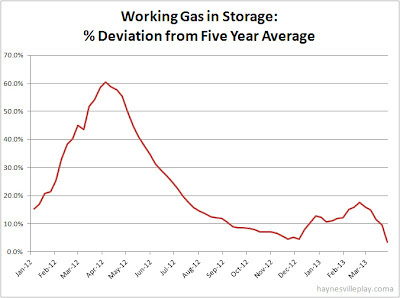 The EIA reported that the level of working gas in storage dropped 145 Bcf to 1.938 Tcf. The weekly withdrawal was 120% larger than last year (-66 Bcf) and 96% larger than the five year average (-74 Bcf). 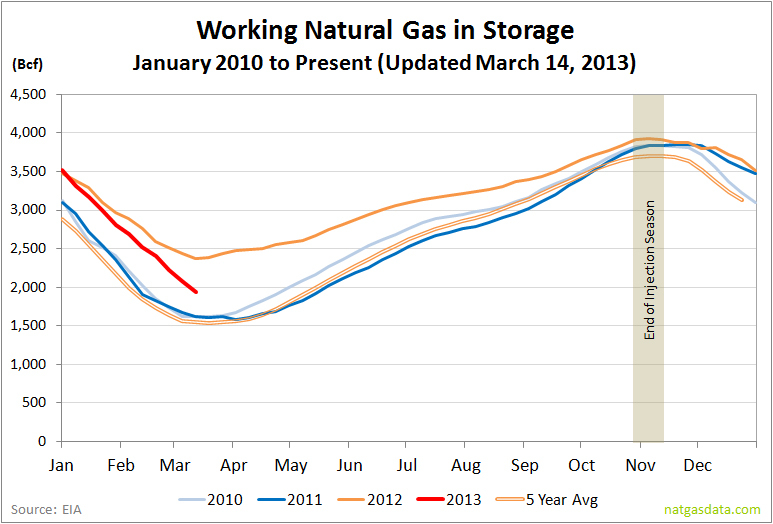 The current storage level is now 18.5% below last year (2.378 Tcf) but 11.4% above the five year average (1.74 Tcf). 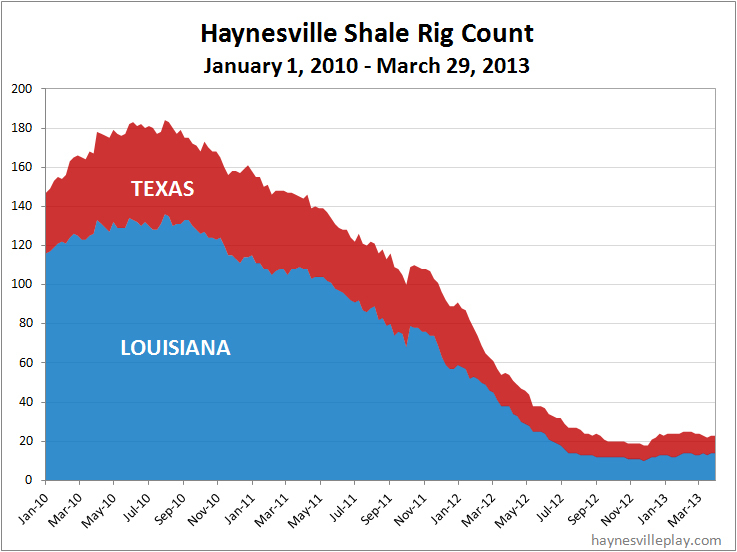 Next Sunday marks the fifth birthday of of the Haynesville Shale. While there are Haynesville wells going back to 2006, I always view March 24, 2008 as the official birthday of the Haynesville Play. That's the day that Chesapeake Energy dropped a bomb of a press release that announced its "discovery" of the play and started the Great Haynesville Land Rush. One can argue that Chesapeake didn't discover the field, especially since Encana completed its first Haynesville well a year before Chesapeake, but they certainly ushered in the boom with a bang. I started this web site in May 2008 as something of a lark, but I quickly became obsessed with following the rapid development of the Haynesville. Over the past five years we have seen earth-shattering changes because of shale gas, and one can trace most of that back to Chesapeake's announcement. I won't replay all of the excitement, but we quickly went from natural gas scarcity to a glut, which killed natural gas prices and pushed most producers to the brink of extinction. But our gas glut and the cheap commodity prices that followed caused a ripple effect in world market that is becoming a tsunami in global geopolitics. Domestic manufacturing is making a comeback - had anyone even coined the word "reshoring" five years ago? We are at the early stages of major national and international changes, all because of U.S. shale gas, and it's fascinating to watch. But ironically some of the biggest drama played out at Chesapeake Energy. "Alphabet Energy, founded in 2009 as a spin-out from Lawrence Berkeley National Laboratory, makes a next-generation thermoelectric material, which is a semiconductor that can convert heat to electricity. When thermoelectric materials come in contact with heat it causes the electrons to move from the hot side of the material to the cold side, and the difference in temperature causes the material to produce electricity." What's in it for Encana? Alphabet is working on a process that converts waste heat into electricity. Encana sees uses for the process in its natural gas drilling and processing operations. It sounds very cool. What strikes me more than anything is the process and speed of innovation that we are witnessing on a daily basis. 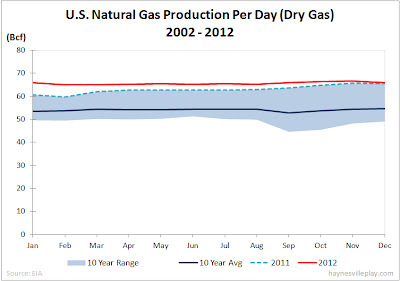 Five years ago (this month) the vast majority of us had never heard of shale gas. Now companies have developed technologies and techniques to extract gas very efficiently in quantities far greater than we can handle. I can only imagine what innovations we will see in the next five years. Labels: Alternative Energy, Deals, EnCana Corp. I don't know why it took so long, but a major beer distributor serving northwest Louisiana announced yesterday that it has ordered 23 compressed natural gas (CNG) tractors to replace its diesel delivery fleet. Shreveport-based Eagle Distributing, Inc., which is a distributor of Anheuser-Bush and InBev products, agreed to a lease agreement with Ryder System for the trucks. Eagle also plans to change out smaller fleet vehicles and is considering building its own fueling station. The deal makes a lot of sense for Eagle. Not only will the company will reduce fueling costs and decrease its carbon footprint, it will take advantage of the fuel that is so abundant in its service area. A win-win-win if ever there was one. The Haynesville Shale rig count was down by one this week to 23. Louisiana was up one to 14, while Texas was down two to nine. One Anadarko rig shifted from Panola Co., TX to Caddo Parish, LA to drill the Caddo Pine Island field. This is the first Anadarko rig in Louisiana in about three years. One of the J-W operating rigs was taken over by and Comstock Resources in DeSoto Parish, LA. This is the first Comstock rig in Louisiana since March 2012. The Baker Hughes U.S. rig count was down five this week to 1,752. Oil rigs were up eight to 1,341, gas rigs were down 13 to 407 and miscellaneous rigs held at four. By type, horizontal rigs were down 11 to 1,130, vertical rigs were down four to 427 and directional rigs were up ten to 195. The Wall Street Journal reported yesterday that BNSF Railway, now owned by Berkshire Hathaway, is moving forward with a pilot project to use natural gas-powered locomotives in its fleet. The pilot will begin this fall and will be based on LNG. It is ironic that one of the biggest carriers of Powder River Basin coal and Bakken Shale oil might become the first train line to move to natural gas power. If nothing else, building LNG fueling infrastructure in the Bakken region will give producers something to do with all that nuisance natural gas other than flaring it - or bringing it to an already glutted market. LNG has a number of advantages for a railroad. The low coast of natural gas is the biggest advantage over diesel. But considerably lower pollution versus diesel is a significant plus given that railroads will be subject to tighter air pollution standards beginning in 2015. Additionally, early indications are that LNG locos will have a longer range per fueling without sacrificing hauling power. Hurdles include the growing pains of developing new rolling equipment (with requisite regulatory approvals for the fueling cars) and building fueling infrastructure. But BNSF seems to think that the upside outweighs the negatives. Last October, CN Railway announced a pilot program to test a dual fuel locomotive (90% LNG/10% diesel) that is still in process. Given the upcoming pollution regulations and the work that GE and Caterpillar are putting into LNG locomotives, I wouldn't be surprised to see more railways looking harder at natural gas. The EIA reported that working gas in storage declined 146 Bcf last week to 2.083 Tcf. The weekly withdrawal was 59% larger than last year (-92 Bcf) and 36% greater than the five year average (-107 Bcf). The current storage level is 14.8% lower than last year (2.444 Tcf) and 14.8% higher than the five year average (1.814 Tcf). "In the Gulf Coast Corridor, Shell plans to install a small-scale liquefaction unit (0.25 million tons per annum) at its Shell Geismar Chemicals facility in Geismar, Louisiana, in the United States. Once operational, this unit will supply LNG along the Mississippi River, the Intra-Coastal Waterway and to the offshore Gulf of Mexico and the onshore oil and gas exploration areas of Texas and Louisiana. To service oil and gas and other industrial customers in Texas and Louisiana, Shell is expanding its existing relationship with fuels and lubricants re-seller Martin Energy Services, a wholly-owned subsidiary of Martin Resource Management Corporation (MRMC). MRMC and its publicly traded affiliate, Martin Midstream Partners L.P. will provide terminalling, storage, transportation and distribution of LNG." Shell is the world leader in LNG for export, a status affirmed by last week's announcement that it will buy the LNG assets of Spanish company Repsol, SA for $4.4 billion. The Repsol deal gives Shell better economics to export its own gas from places like Peru and Trinidad and Tobago. If LNG export doesn't work out in the U.S. because of political pressures, at least Shell has an export outlet to capitalize on the imbalance of natural gas prices worldwide. Sundrop Fuels, a Colorado-based biofuels company, closed on a second land acquisition in the Alexandria, LA area last week. The company bought 1,213 acres for $4.752 million. The property is adjacent to another 27.5 acres that will serve as the company's regional headquarters. Sundrop, which is backed by Chesapeake Energy, plans to convert wood chips and forest debris using natural gas into "green gasoline." The Alexandria project is more of a pilot project with a projected output of around 1.2 million barrels per year. If successful, the company will aim to build a larger plant using the same methodology. Does New Energy Secretary Get Shale Gas? President Obama today nominated two people for cabinet positions that will have a significant impact on the energy industry. He nominated MIT physicist Ernest Moniz to head the Department of Energy and Gina McCarthy to head the EPA. From all indications, Ernest Moniz has a long-term view of energy that is heavy on solar and renewables but a short-term realistic approach to what fuels us now, specifically fossil fuels and nuclear. He has been a proponent of the "natural gas as a bridge fuel" argument and has shepherded research at MIT that was favorable towards shale gas and fracking. Ultimately, his position on fracking matters little given that the DOE has no real control over the process, but it is good for the natural gas industry to have a sympathetic ear at the top. The Haynesville Shale rig count didn't change this week, holding at 24, with Louisiana and Texas both sticking at 13 and 11, respectively. Baker Hughes reported that the U.S. rig count is down four to 1,757 this week. Oil rigs were up four to 1,333, gas rigs were down eight to 420 and miscellaneous wells held at four. 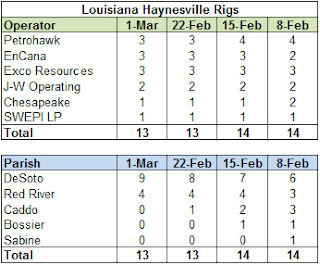 Horizontal rigs were up one to 1,141, vertical rigs were up seven to 431 and directional rigs were down 12 to 185.